Fridge Filterz FFMT-315-1 cyst filter (Standard 42 & 53) 1 Pack replacement water filter is designed to fit selected Whirlpool*, KitchenAid*, Maytag*, Amana*, Jenn-Air* & Kenmore* refrigerators. This premium water filter is designed to remove fine sediment, Chlorine Taste and Odour as well as contaminants and heavy metals including Lead, Mercury, Lindane, 2-4-D, atrazine and benzene, to name a few, that may be present in your drinking water. This refrigerator filter replaces: Whirlpool*, KitchenAid*, Maytag*, Amana*, Jenn-Air* using Filter UKF8001 or UKF8001AXX, KitchenAid* Filter - Kenmore* Filter 46-9006, 9006, 469006. The FFMT-315-1 is tested to meet NSF/ANSI Standard 42 & 53, Particulate Class I, to ensure that you are getting a SAFE, quality product. Fridge Filterz are manufactured to the highest quality standard, providing you and your family with clean, odour free ice and water without removing beneficial minerals and fluoride that may be present in your drinking water. The H2O+ Circle Triple Filter Replacement Pack includes the Sediment, Pre-Carbon Plus and Post Carbon Block filters. These three filters together with the RO Membrane filter reduce harmful VOCs, chlorine, fluoride, heavy metals, cysts, industrial chemicals, bad taste and odour in the water. The filters are simple to replace with the easy twist and seal system. The LED filter change indicator included in the provided faucet will let you know when it's time to change the filters. Recommended triple filter replacement is every 6 months. This EcoPure Pleated Replacement Filter reduces sediment including sand, dirt and rust, which will extend the life of your home's water using appliances. These universal filters fit seamlessly into our EcoPure EPWO4 whole home housing and can be used with all major brands of sump-style whole home filtration systems. For best filtration results, filters should be replaced every three (3) months, as recommended. 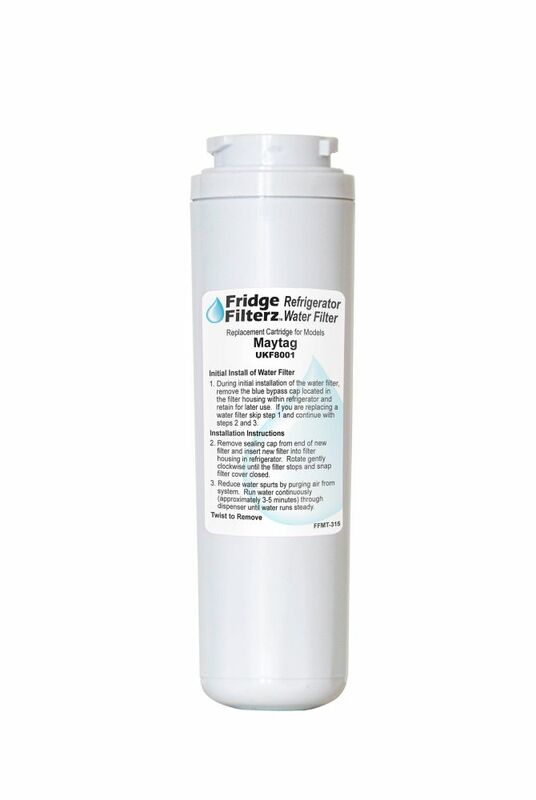 Replacement Refrigerator Water & Ice Filter for Maytag UKF8001, Amana, KitchenAid Refrigerators Fridge Filterz FFMT-315-1 cyst filter (Standard 42 & 53) 1 Pack replacement water filter is designed to fit selected Whirlpool*, KitchenAid*, Maytag*, Amana*, Jenn-Air* & Kenmore* refrigerators. This premium water filter is designed to remove fine sediment, Chlorine Taste and Odour as well as contaminants and heavy metals including Lead, Mercury, Lindane, 2-4-D, atrazine and benzene, to name a few, that may be present in your drinking water. This refrigerator filter replaces: Whirlpool*, KitchenAid*, Maytag*, Amana*, Jenn-Air* using Filter UKF8001 or UKF8001AXX, KitchenAid* Filter - Kenmore* Filter 46-9006, 9006, 469006. The FFMT-315-1 is tested to meet NSF/ANSI Standard 42 & 53, Particulate Class I, to ensure that you are getting a SAFE, quality product. Fridge Filterz are manufactured to the highest quality standard, providing you and your family with clean, odour free ice and water without removing beneficial minerals and fluoride that may be present in your drinking water. Replacement Refrigerator Water & Ice Filter for Maytag UKF8001, Amana, KitchenAid Refrigerators is rated 4.0 out of 5 by 7. Rated 2 out of 5 by MikeB from Plugs too fast I'm glad I only bought 1, it took 2 months to get to point our last filter took 6 months to get to, we have fairly clean water so it shouldn't plug up this quickly. Now we already have to buy another one, these things aren't cheap! Rated 4 out of 5 by Happy Customer from Previous filter from an older model! Previous filter was from an older model. This new filter was compatible and worked out great! Rated 5 out of 5 by DaiWill from Easy to install I bought this to replace the filter in the refrigerator because in the past we had trouble finding them in stores so when I could order them on line I tried it and the whole experience from ordering to delivery was wonderful. Rated 5 out of 5 by Ginny from Works. Great and at a great price. Works great. Fast delivery. Great price and free delivery. Rated 3 out of 5 by Dee tee from Good Bought this few months ago, they were the cheapest around town. It fits a little smaller, but seems to do the job. just wish these things were not so expensive.